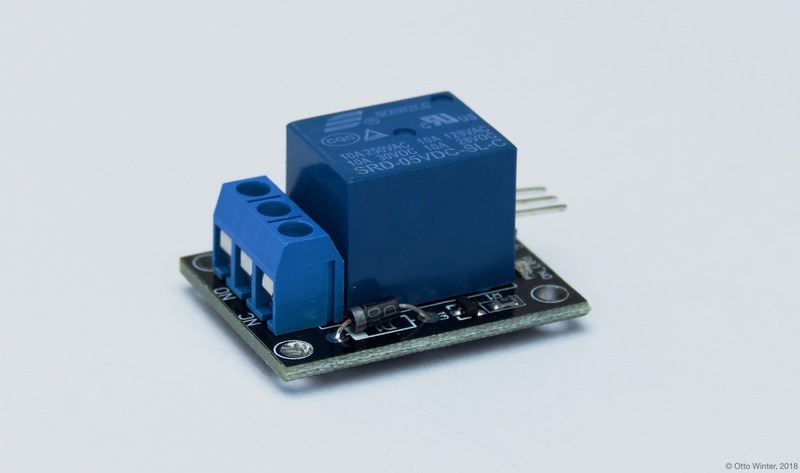 Relays are simple electronics components that allow you to switch a high load using only a single pin on your board. On the inside of a relay there is a coil that’s connected to the input signal. Every time the input signal switches on, the current flowing through the coil induces a magnetic field that closes a contact. On the output side you have three pins: common (COM), normally open (NO) and normally closed (NC). Connect COM and one of NO and NC in series with your load. When the input turns on, NO is connected to COM and when the input turns off, NC is connected to COM. Relays are a very common component in electronics, so there are many types of them and I won’t attempt to describe all of them (partly due to my own lack of knowledge). Please check with the datasheet of your relay to see its current limits, what voltage it requires and so on. Please also note that relays are physical components - as such, they have a limited number of switches that can happen before they break. To use a relay with ESPHome, use a GPIO Switch. For a more complete example, check Simple Garage Door.